Fabinho insists he wants to stay and fight for his place at Liverpool. The Brazilian midfielder made a slow start to his career at Anfield, following his £43.7m move from Monaco last summer. Fabinho did not appear in Liverpool's first eight Premier League games of the season, with Jurgen Klopp admitting he needed "time to adapt". But the 25-year-old says he is happy with his role, amid links with a January move back to Ligue 1 with Paris Saint-Germain. "I was told there was something in the press, but I never said I would like to leave Liverpool," Fabinho told UOL. "I knew I would need to have patience to wait for my moment. I am happy at Liverpool. There is no reason for me to leave." Fabinho has faced a battle to break into Liverpool's starting line-up, with James Milner, Jordan Henderson, Naby Keita and Georginio Wijnaldum also vying for places in central midfield. 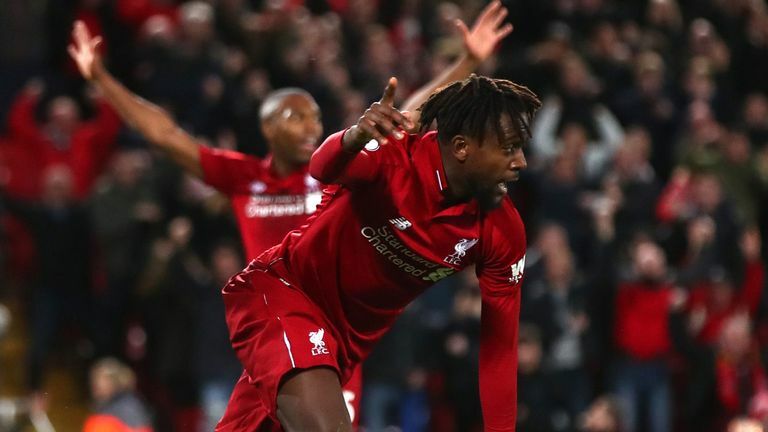 But he has begun to win that battle in recent weeks, appearing in each of Liverpool's last six league games, while starting four, including Sunday's 1-0 win over Everton in the Merseyside derby. "[Klopp] did not give me a lot of explanations but I concentrated on my work in training and stayed focused on my work, without letting my head drop," Fabinho said. "I tried to work because I knew opportunities would come. Now I just want to increase my number of games. "In the last few matches I have played more and I believe that [I am] playing a good role. Since football is very intense here, I have to be very well prepared when the opportunity arises."